The events at Lonmin Mine in Marikana in the North West Province were a tragic stain on the history of post Apartheid South Africa. This timeline chronicles the events that unfolded prior and post the 16 August Marikana shooting and the subsequent aftermath. The build-up to the killing of 34 mineworkers by the South African Police was marked by incidents of intimidation and assault. The Lonmin mineworkers strike was viewed by many as the biggest strike that threatened to destabilize the mining sector in Rustenburg area with grave implications for the rest of the mining industry. The mineworkers strike was led by Joseph Mathunjwa, president of the Association of Mineworkers and Construction Union (AMCU). 9 August, A number of employees from Lonmin Mine go on strike demanding a wage increase. 10 August, Employees who turn up for duty report incidents of intimidation and assault. Two employees are shot and taken to hospital for treatment. 11 August, Faction fights occur. Reports of three more employees, shot in the hostels in separate incidents, surface. 12 August, Five employees are shot and taken to hospital while others are assaulted. Two mine security officers are hacked to death by protesters and their vehicles torched. Striking workers infiltrate production areas, assaulting three on duty employees, fatally wounding one and torching six motor vehicles at the plant. 13 August, Three dead bodies of mine workers are found. SAPS members are attacked while escorting the protesters. Two SAPS members are hacked to death, one critically wounded. Three protesters are fatally wounded in police response to the attack. 15 August, Mineral Resources Minister, Susan Shabangu says she is "gravely concerned" about the violent protests at Marikana. Police and striking mineworkers attempt to negotiate a truce with miners on a hill which had become a gathering point for the mineworkers near the Lonmin mine. Lonmin refrains from issuing warning letters to striking workers in order not to destabilize the ongoing negotiations. 16 August, Lonmin says it has lost six days or 15 000 ounces of platinum at Marikana and is unlikely to meet its full-year production target of 750 000 ounces regardless of issuing striking workers with an ultimatum that they return to work or face dismissal. 17 August, Police Minister Nathi Mthethwa says on Talk Radio 702 that more than 30 people were killed and scores were injured. 17 August, NUM General Secretary Frans Baleni says union shop-stewards report that 36 union members were killed at Marikana. 17 August, Lonmin shares drop by almost five percent in London and four percent in Johannesburg following news of the massacre. 17 August, National Police Commissioner General Riah Phiyega confirms that 34 people were killed at Marikana, 78 were injured and 259 were arrested. 17 August, President Jacob Zuma leaves the SADC summit in Mozambique to visit the site of the massacre. 18 August, Expelled ANC Youth League leader, Julius Malema, tells striking Marikana mineworkers that they should die for their cause, urging other mineworkers to join them. 23 August, The Marikana Commission of Inquiry is appointed by President Jacob Zuma to investigate events arising out of the tragic incidents at the Lonmin Mine in Marikana. 23 August, The country observes a national day of mourning in respect of the deaths at the Lonmin mine. Expelled ANCYL leader Julius Malema, calls for a "mining revolution" in South Africa. 30 August, Authorities charge the 270 arrested workers with the murder of their colleagues shot on 16 August. 3 September, Court withdraws murder charges against the 270 people detained in the aftermath of the massacre and the first batch of workers is released from custody. 11 September, The body of a male person hacked to death is found at Marikana, raising the death toll to 45. 12 September, Another strike begins at mines operated by Anglo American Platinum (Amplats), a separate company which operates in the Rustenburg area, North West. 15 September, South African National Defence Force (SANDF) members are on standby at Nkaneng Informal settlement in Marikana. 18 September, Workers at Marikana secure pay increases of between 11 and 22%, and agree to end the strike. 20 September, As the Marikana miners return to work, unrest continues at Amplats mines in Rustenburg, where workers demand similar pay raises to those won by the Lonmin miners. 1 October, The Marikana Commission of Inquiry into the 16 August killings opens in Rustenburg. 11 March, Steve Khululekile, regional leader of the AMCU and key witness in the Farlam Commission is shot dead in a tavern by three unidentified gunmen. 15 March, The national police commissioner Riah Phiyega begins testifying before the Marikana Commission of Inquiry. 21 March, The Workers and Socialist Party of South Africa is launched at the Lucas Van Den Bergh Community Hall in Pretoria. 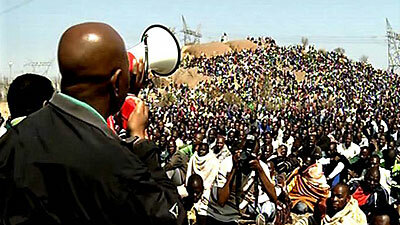 25 March, The sangoma believed to have performed rituals on protesting Lonmin mineworkers in Marikana, is gunned down. 8 May, Lungani Mabutyana one of the witnesses to the Marikana Commission commits suicide near the scene where the police shot dead mineworkers. 17 June, A cleansing ceremony is held in Marikana by the families of those killed during illegal strikes at Lonmin’s platinum mine. 14 August, Lonmin and AMCU sign an agreement recognizing the latter as the majority union at the mine.